Hydrazine is a chemical compound with the formula N2H4. It has an ammonia-like odor, and its liquid range and density are similar to those of water. It is widely used in chemical synthetic reactions, and it is a component of some rocket fuels. It is, however, very toxic and dangerously unstable, especially when not mixed with water. Hydrazine has a simple molecular structure. Its formula may be written as H2N-NH2, to indicate that there is a covalent bond between the two nitrogen atoms. Conceptually, this structure would arise by coupling a pair of ammonia (NH3) molecules to form the N-N bond, accompanied by the loss of one hydrogen atom per ammonia molecule. Within a hydrazine molecule, each H2N-N subunit has a pyramidal structure. The N-N distance is 1.45 angstroms (Å), and the molecule adopts a gauche conformation. The rotational barrier is twice that of ethane. These structural properties resemble those of gaseous hydrogen peroxide, which adopts a "skewed" anticlinal conformation, and also experiences a strong rotational barrier. Free hydrazine was synthesized for the first time by Theodor Curtius in 1889, by a circuitous route. Another synthetic process (called the Olin Raschig process) was announced in 1907, involving the use of sodium hypochlorite and ammonia. This method relies on the reaction of chloramine with ammonia. In the Atofina-PCUK cycle, hydrazine is produced in several steps from acetone, ammonia, and hydrogen peroxide. Acetone and ammonia first react to give the imine, followed by oxidation with hydrogen peroxide to the oxaziridine, a three-membered ring containing carbon, oxygen, and nitrogen. That is followed by ammonolysis to the hydrazone, a process that couples two nitrogen atoms. This hydrazone reacts with one more equivalent of acetone, and the resulting azine is hydrolyzed to give hydrazine, regenerating acetone. Unlike the Raschig process, this process does not produce salt. The PCUK stands for Produits Chimiques Ugine Kuhlmann, a French chemical manufacturer. In 2001, microbiologist Marc Strous of the University of Nijmegen in the Netherlands discovered that hydrazine is produced from yeast bacteria and the open ocean bacterium anammox (Brocadia anammoxidans). 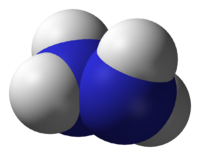 They are the only organisms known to produce hydrazine naturally. Hydrazines are part of many organic syntheses, many of which are of practical significance in pharmaceuticals, such as antituberculants, as well as in textile dyes and in photography. The acetone azine is an intermediate in the Atofina-PCUK synthesis. Direct alkylation of hydrazines with alkyl halides in the presence of base produces alkyl-substituted hydrazines, but the reaction is typically inefficient due to poor control on the level of substitution (same as in ordinary amines). The reduction of hydrazones to hydrazines present a clean way to produce 1,1-dialkylated hydrazines. In a related reaction 2-cyanopyridines react with hydrazine to form amide hydrazides, which can be converted using 1,2-diketones into triazines. Hydrazine is used in the Wolff-Kishner reduction, a reaction that transforms the carbonyl group of a ketone or aldehyde into a methylene (or methyl) group via a hydrazone intermediate. The production of the highly stable dinitrogen from the hydrazine derivative helps drive the reaction. Being bifunctional, with two amine groups, hydrazine is a key building block for the preparation of many heterocyclic compounds via condensation, with a range of difunctional electrophiles. With 2,4-pentanedione, it condenses to give the 3,5-dimethylpyrazole. In the Einhorn-Brunner reaction, hydrazines react with imides to give triazoles. Hydrazine is used to cleave N-alkylated phthalimide derivatives. This scission reaction allows the phthalimide anion to be used as an amine precursor in the Gabriel synthesis. Hydrazine is used in many processes. Examples include: production of spandex fibers, as a polymerization catalyst; a blowing agent; in fuel cells, solder fluxes; and photographic developers, as a chain extender in urethane polymerizations, and heat stabilizers. In addition, a semiconductor deposition technique using hydrazine has recently been demonstrated, with possible application to the manufacture of thin-film transistors used in liquid crystal displays. A solution of 70 percent hydrazine and 30 percent water is used to power the EPU (emergency power unit) on the F-16 fighter plane. The explosive Astrolite is made by combining hydrazine with ammonium nitrate. Hydrazine was first used as a rocket fuel during World War II for the Messerschmitt Me 163B (the first rocket-powered fighter plane), under the name B-Stoff (hydrazine hydrate) and in a mixture with methanol (M-Stoff) and hydrogen peroxide called C-Stoff. Other variants of hydrazine that are used as rocket fuel are monomethylhydrazine, CH3NHNH2 (also known as MMH) and unsymmetrical dimethylhydrazine, (CH3)2NNH2 (also known as UDMH). These are used as two-component rocket fuel, often together with dinitrogen tetroxide, N2O4. ↑ 1.0 1.1 N.N. Greenwood, and A. Earnshaw, Chemistry of the Elements (Oxford, UK: Butterworth-Heinemann, 1997, ISBN 0750633654). ↑ Gary L. Miessler, and Donald A. Tarr, Inorganic Chemistry, 3rd Edition (Upper Saddle River, NJ: Pearson Education, 2004, ISBN 0-13-035471-6). ↑ A.F. Holleman, and E. Wiberg, Inorganic Chemistry (San Diego, CA: Academic Press, 2001, ISBN 0-12-352651-5). ↑ J. Prakt Curtius, 1889, Chem 39:107-39. ↑ R. Adams, and B.K. Brown, 1941, Hydrazine Sulfate Organic Syntheses, Coll. 1:309. Retrieved February 25, 2008. ↑ Emil Raymond Riegel, "Hydrazine" Riegel's Handbook of Industrial Chemistry (New York, NY: Van Nostrand Reinhold, ISBN 0442001754). ↑ Brian Handwerk, 2005, Bacteria Eat Human Sewage, Produce Rocket Fuel National Geographic. Retrieved February 25, 2008. ↑ A.C. Day, and M.C. Whiting, 1988, Acetone Hydrazone Organic Syntheses, Coll. 6:10. Retrieved February 25, 2008. ↑ R.H. Wiley, and P.E. Hexner, 1963, 3,5-Dimethylpyrazole Organic Syntheses, Coll. 4:351. Retrieved February 25, 2008. ↑ L. Friedman, R.L. Litle, and W.R. Reichle, 1973, p-Toluenesulfonyl Hydrazide Organic Syntheses, Coll. 5:1055. Retrieved February 25, 2008. ↑ N.M. Weinshenker, C.M. Shen, and J.Y. Wong, 1988, Polymeric carbodiimide Organic Syntheses, Coll. 6:951. Retrieved February 25, 2008. ↑ 12.0 12.1 R. Vieira, C. Pham-Huu, N. Keller and M. J. Ledoux, 2002, New carbon nanofiber/graphite felt composite for use as a catalyst support for hydrazine catalytic decomposition, Chemical Communications 9:954—955. ↑ 13.0 13.1 Xiaowei Chen, et al., 2002, Catalytic Decomposition of Hydrazine over Supported Molybdenum Nitride Catalysts in a Monopropellant Thruster, Catalysis Letters. 79:21–25.